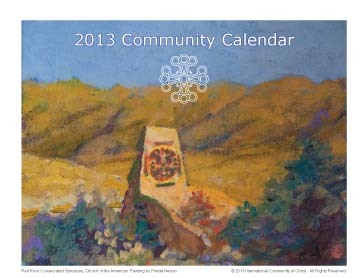 The 2013 Community Calendar will be in the mail to all Community members before the end of the Advent Vigil. The calendar follows the traditional monthly format beginning with January, but it contains all the important dates of The Community’s Sacred Calendar year, which begins on February 2nd (See Jamil: Child of Light, chapter 27). In addition to dates for liturgical observance or remembrance, the calendar also indicates the moon phases for the year and, in relation to these moon phases, the optimal days to view sunrise or sunset according to the Lunar/Solar Cycle Generative Technique familiar to Cosolargists who have advanced through The Cosolargy Papers. This year’s calendar includes several original paintings done by Canadian artist and Consociate Frieda Nelson. Each of the paintings was inspired by her visits to The Community sanctuary in recent years. Frieda has agreed to make full color prints of these works available to fellow Community members. These will be produced in 5×7, 8×10 and 11×14 standard sizes for framing and in popular sizes of postcards and personal note cards. All are reasonably priced. Please refer to the order form enclosed with your printed calendar or click on the PDF of the order form below. Her paintings are sensitive and inspiring. We encourage you to encourage her to continue her creative work. Our thanks goes to Deacon Dr. Stephan Fuelling for compiling and designing the calendar in consultation with the publishing, editing, and liturgical departments and with Bishop Gene Savoy Jr. We also thank the Rev. Ben Hubbard, who prints the calendar using our Toshiba e-Studio printing system at our production facilities located at the Steamboat Hot Springs Priory. We expect you will find this year’s Community Calendar useful and that the full-color format and beautiful photography will be an inspiration to you throughout the year. When you receive your print copy of the calendar, please remember to make the suggested donation of $15.00 to help defray costs.